Do y’all feel like Instagram has taken the place of our blogs? I do… and there’s no bigger fan of Instagram than this Farmer, but I have completely left the rhythm of taking pictures with my REAL camera, uploading them and writing about them. I’m not making any New Year’s resolution about better blogging and picture taking, but I do need to make the conscious effort. I’m not quitting a bad habit – per se – of solely relying on my iPhone for pics, I need to amend the habit. What struck me was right after my Farmdale open house back in November, I wanted to snap some pics – good pics – of my table and pretty flowers around the house. It hit me like a ton of bricks that no filter can do any better than my nice, expensive “REAL” camera… the same one I could not even think where to find! I am so fortunate to work with amazing photographers for my books and magazine articles, and they don’t use their iPhones for those shoots… nope… they use very technologically savvy cameras that make the photos in my books and magazine articles so lovely. I needed to get back into that habit. My photos aren’t nearly as amazing as theirs, but I can take a decent, not too pixilated, no-filter-required photograph. So I dusted off the “real” camera and had the best time rediscovering the joy of a beautiful image taken by a device intended to do so. I’m not professing my photography skills to be any but amateur, but I do feel that some things are worth capturing with a little more than my iPhone. Things such as the PHENOMENAL work that my friends Maggie Griffin and Chris Hamm helped me with – flowers for Farmdale. Flowers, y’all, in my favorite shades of “Carl” were in every vase, julep cup and mason jar I own! 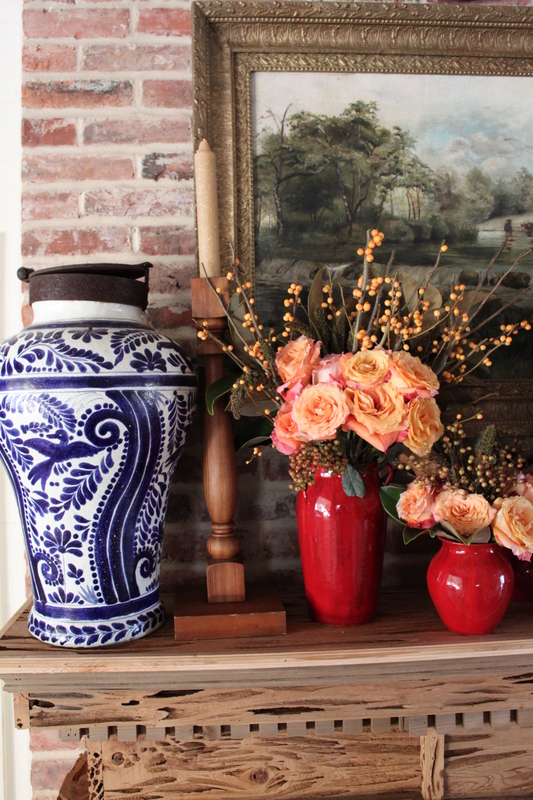 Maggie even helped me fill some of my deep red pottery vases from Cashiers with “Free Spirit” roses, Ilex berries and Nandina from the yard. I couldn’t get enough of that combo set with my big ol’ blue and white jardinières from San Miguel atop my pecky cypress mantel. Truly orangey, “Carl” amaryllis peeked out of some wicker lined jars and my champagne buckets – arranged with assorted fall foliages too… all cut from the land… and maybe an obliging bank parking lot. My buddy Chris, who had stopped through Perrydise with his son en route to Birmingham, stood guard as I “borrowed” my favorite magnolia leaves from my secret stashes around town. I have great magnolia on my land, but there’s just something about those tighter, smaller green leaves with fuzzy brown backs of “Little Gem” and “Brackens Brown Beauty.” I’ll plant some at Farmdale, but until they grow big and tall, I hope the other local sources don’t mind…ha! In true Farmer style, I had taxidermy keenly placed as my dining room centerpiece. Ottie, the Otter, and Woody, the Wood Duck, are forever immortalized on a piece of driftwood – and naturally look so good as a dining table centerpiece, right? 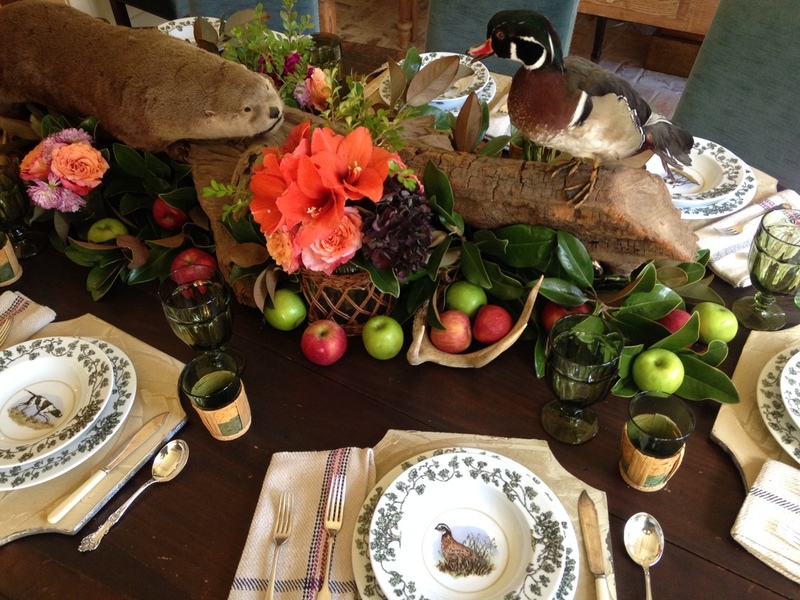 More magnolia, some shed antlers, scattered apples and a few bouquets of more flowers rounded out the tableau, set off by my friend William Lamb’s handsome dinnerware and my aunt’s Provvista chargers. Mismatched hotel silver, fish sets and plaid napkins softened the setting too. I love a handsome yet elegant look for a table and even in my interior design style too. 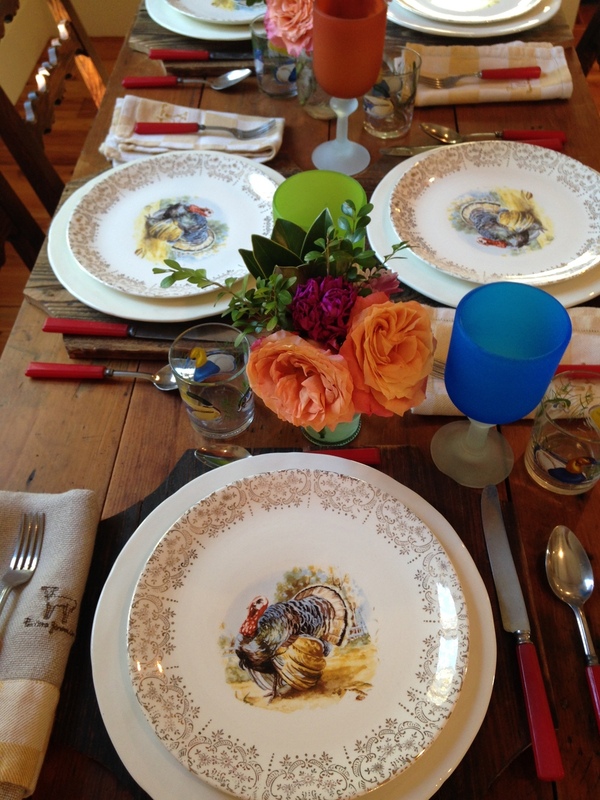 But there is just something so fun about setting the table and bringing all the wonderful elements together. On my kitchen table, I set the place settings with my Big Mama’s turkey plates. This Thanksgiving with Napp marked five generations that have eaten from them – what a treasure! Mixing is key to a great look, and I love mixing up sets and breaking a suite for rhythm and cadence. Old Bakelite flatware, my Mama’s favorite Murano glass goblets fromNeiman’s, Provvista linens and chargers and my vintage set of wetland bird low ball glasses all came together as a fun, jovial feel for the kitchen. A series of family and found platters are arranged and hung on my kitchen wall and provided a needed, neutral backdrop for the colorful fall tableau set before them. One of my favorite niches at Farmdale is my sister Meredith’s loft. Set above the Chippendale stairwell, her loft is a comfy living space for her and her friends to talk and hang-out and enjoy one another’s company. A French canapé styled sofa with its original aqua velvet and brass nailheads anchors the space. An antique Kilim rug grounds the loft its colors are reflected on the wall with a triptych of abstract paintings by my friend Renee Bouchon. Soft mauve, aqua and a punch of citrusy yellow in the Schumacher “Citrus Garden” pillows Maggie Griffin gave me gives the room that perfect balance of old and new, chic and classic all with a youthful twist. Meredith calls her style “Grandma Chic” and I have to admit I LOVE it too! We had close to two hundred folks come tour Farmdale. Lunch was served on the front lawn – and a delicious lunch it was! 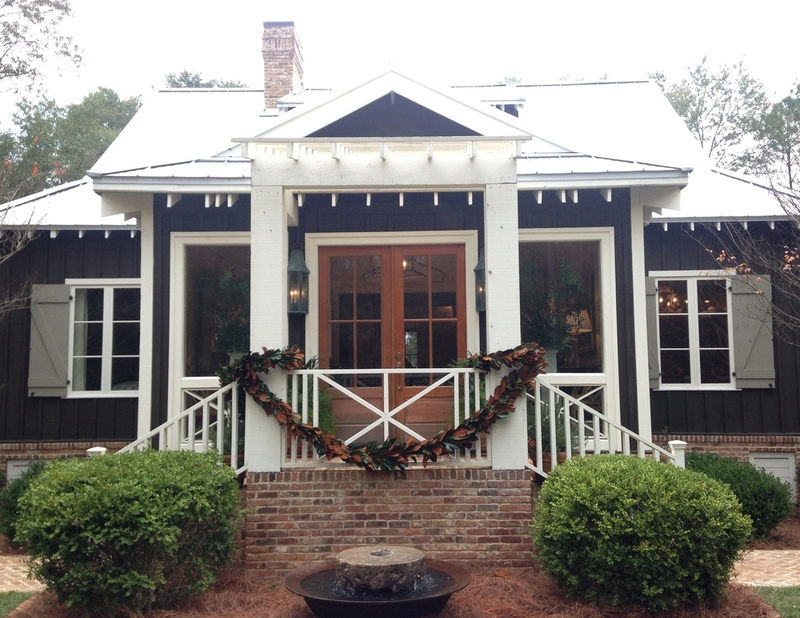 My friend Megan at the Perfect Pear in Downtown Perry, made boxed lunches filled with chicken salad, pimento cheese and her signature White Balsamic Dressing topped off the greens. Megan also made my Sweet Tea Cake from A Time to Celebrate for our dessert… sadly there were no leftovers! The weather could not have been more enjoyable! My team of gals at JFI once again rose to the occasion and helped me pull off the event – Erica (the now Mrs. Joseph Stewart and Jesse Noble, my lead designer, were, as usual, my right and left arm and ensured the day’s success. From touring folks, to taking tickets to answering paint color queries, these gals and my team of Maggies and other friends too made the day a true fete accomplis. Later the next week, I hosted Thanksgiving proper for my family at Farmdale. The roses were a touch past peak, the amaryllis were still going strong but shed a blossom or two and the magnolia had a crunchy edged – but the memory of the tour and the images too made the day come to life again. I hope y’all enjoy a bit of Farmdale and hope to see y’all at our next open house! When??? Lord only knows but I’ll keep you posted. Until then, I hope your Thanksgiving and Christmas and now New Year seasons were merry and bright.